It was just a few years ago when ‘bloggers’ were perceived as being mostly women. To be more specific ‘women in fashion’. Or you may have also thought of New York fashion bloggers. All big cities have their own distinctive style, each having their own trends and fashion tendencies based largely upon the local weather, lifestyle and local taste. For men, the Los Angeles fashion scene has always been considered ‘California casual’ and has been notorious for shorts, chinos, flip flops, tees and polo shirts. But not anymore! In recent years, Los Angeles has been going through significant revitalization from entertainment, art, food and, yes, even fashion. But in particular: men’s fashion! The days are long gone when men were labeled as ‘metrosexual’ (which, by the way, was a term I’ve never liked) just because they cared about their appearance. It’s now more common and socially acceptable for guys to be fashionable and to take pride in their grooming routine and overall appearance without having to be mislabeled, and without having any actual involvement in the men’s fashion industry. Thanks to the recent rise of social media, nowadays you can also easily find menswear bloggers throughout all platforms. In L.A., menswear influencers have not only taken the social media fashion scene by storm but they have also replaced the traditional ‘California casual’ uniform with an entirely new fashion. These influencers are not just blogging about their suits and ties, they’re blogging about street style, athletic wear, casualwear, full suits and men’s high fashion. But it doesn’t end there. The L.A. men’s fashion scene has grown so rapidly that meetup groups and collaborations amongst bloggers and brands are happening everywhere! 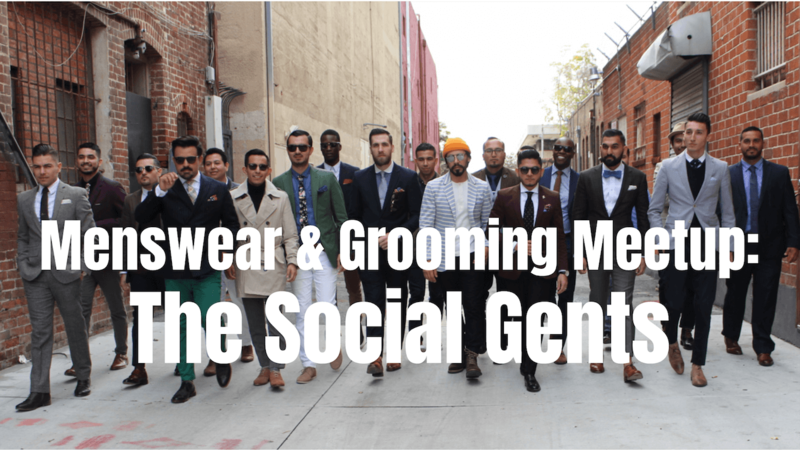 The first and largest networking and menswear social club in L.A. is known as ‘The Social Gents’, created by Steve A. Nunez, owner of ‘The Social Cut’, a men’s grooming cafe offering gourmet coffee, a barbershop and tailoring services. Steve created The Social Gents in an attempt to feed the need to unite ‘modern gentlemen’ and to provide a platform for men’s’ fashion influencers to socialize, facilitate networking and cross promotion, and and to be able to confidently talk men’s fashion and grooming. As a blogger and business owner in the men’s fashion and grooming industry, Steve couldn’t find events to network with fellow bloggers and other entrepreneurs in the industry. Menswear fashion meetups in L.A. have been scarce, and when he did finally stumble upon potential meetups, he found that these events are exclusive to influencers with large followings and clicks are notorious. Steve then decided that he wanted to do away with that industry culture and create a new culture in the men’s fashion world by creating a meetup where every gentleman that attends feels welcomed and confident, regardless of the size of their following. And Steve hoped that attendees come out learning something new and create new friendships, partnerships and collaborations. The Social Gents’ goal is to bring fashion bloggers, influencers, menswear enthusiasts, fashion industry people, designers, stylists, labels and anyone interested in menswear and men’s grooming together to connect face-to-face, collaborate and share life experiences. At The Social Gents’ meetups, guests are greeted with a gift bag filled with dapper goodies provided by brand supporters. The brand supporters utilize these events as an opportunity to interact with menswear enthusiasts in a more personal way and also to promote their brands and products. Attendees also enjoy complimentary libations as they mingle and enjoy different activities such as wine tasting, listen to panel discussions by top menswear brands and influencers, experience a grooming lounge and the much anticipated photo ops, to name a few. 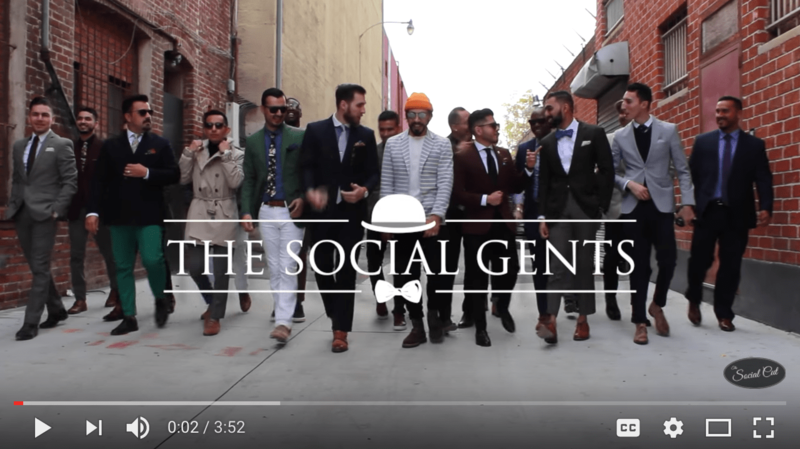 The Social Gents have hosted menswear events throughout Southern California from Los Angeles, to Pasadena, to Downtown Pomona. They’ve had the likes of George Laboda, a highly popular men’s lifestyle influencer and co-creator of ‘Gents Lounge’, and participation from major brands such as: SprezzaBox, Ties.com, The Tie Guys, Harrison Blake, Johnny B and Cremo Company to name a few. It’s also an exciting time for menswear enthusiasts with so many new men’s fashion brands popping up on social media and looking to build connections with influencers. Established companies are also taking notice of the modern gentleman by making more grooming products tailored for men. Beauty stores, such as Sephora and Ulta, which traditionally catered only to females, are now adding or significantly expanding their men’s grooming sections to cater to the modern gentlemen. This ‘groomed gentlemen’ lifestyle goes way beyond just clothes and grooming. It’s a revitalization of the gentleman that takes pride in himself, his work and shares the best fashion and professional advice. We don’t want to prep you for a fashion runway. We just want you to look and be your best!